The ferry from Bol to Jelsa took us roughly an hour and half. The boat dropped us right in the heart of town where our guide Matej spends a few weeks in his family’s house every summer. Matej took us on a short walking tour of the oldest city on the island before showing us somewhere to get the gelato we weren’t able to find the day before. This Gelato, according to Jerry of Ben & Jerry’s, was the best in Croatia. Then we boarded a shuttle that would take us on to Hvar Town, our home for the next three nights. Thursday saw us leave Dubrovnik and join up with those who would be arriving for the biking tour of Brac and Hvar. This meant a drive up the coast to the area around Split. The drive up the coast was beautiful with the Adriatic and islands on one side and mountains on the other. And the drive actually allowed us to pass through another country. The coast of Croatia is broken in one spot where Bosnia and Herzegovina have their own little section. 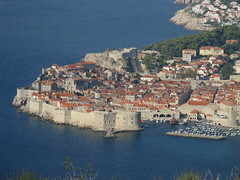 One of our guides indicated that this was due to the fact that during the time that Dubrovnik was a republic it actually gave away some of its coastline to the Kingdom of Herzegovina, a strong military power, in exchange for protection. So, as a result, that portion even after the breakup of Yugoslavia is still not part of Croatia. Sadly, we didn’t get our passports stamped as they don’t do this for those who are just transiting. We arrived in Trogir, a small city less than a half hour from Split, just after lunchtime and so checked into the hotel and set out to look for some lunch. 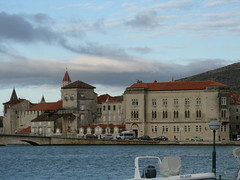 Trogir has its own old city complete with narrow streets and contained on what is essentially an island in the middle of the larger city. Sadly, it was pouring rain so we sought refuge under a café’s canopy and ate a warm lunch of soup. The rain let up a bit after lunch and so we walked over to the city’s tower, which isn’t much of a tourist attraction and wasn’t open, but looks impressive from the outside. 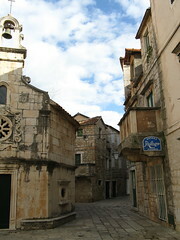 We then continued on into the narrow cobbled streets and wandered around for a fair amount of time. Meg and I recently returned from a trip to Croatia. We get asked all the time about how we chose Croatia as a destination, so I figure I’ll lay out the reason here right off the top. We were in the market for a cycling vacation of some sort, one that was fully supported so we didn’t have to carry our own gear. In Meg’s investigation of available trips she happened upon some in Croatia. Some friend’s of ours had ventured their in the past and let us know that it was a beautiful country and so, we thought, why not and booked a tour with Vermont Bicycle Tours and began eagerly anticipating the event.